When you have the ability to evoke emotion through a medium like music, people will pay attention. At least we hope they will. Every time I listen to The Idler Wheel…, Fiona Apple’s latest, I get chills. Her poetry grabs me with unusual lines, rhyme schemes, and an orchestration unlike anything. The way she innovated sound and percussion on this record is making a lasting impression on me. Released in June on Epic, The Idler Wheel Is Wiser Than the Driver of the Screw and Whipping Cords Will Serve You More Than Ropes Will Ever Do is in fact, epic. Not only because of the lengthy title. 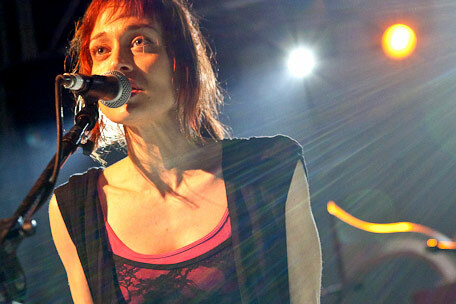 Fiona Apple, now 35, is an interesting character. Not just because of the interesting music she makes. In a New York Magazine interview, she’s watching Mob Wives as per recommendation and getting high late into the night with interviewer, Dan Lee. And on an episode of Marc Maron’s WONDERFUL (if you aren’t listening to his interviews, START NOW, hint hint he interviews Jack White near perfectly) WTF Podcast she talks about her obsessions with hummingbirds, her allergy to gluten, how she likes to wrestle with her boyfriends, make smoothies out of vegetables, and glosses over the time when she was physically attacked as a girl in her hometown of Manhattan. She’s funny and a good storyteller. A space cadet in her own sense, she’s obsessive and real. Apple sounds like the perfect hangout buddy. Having produced this record with her drummer, Charley Drayton, it gives it that spice of unusualness. The track listing is a remarkable list. Songs are perfectly ordered and they play off one another balancing the instrumental stomping she uses on tracks like “Periphery” [below]. And her skill on the piano is unmatched. She uses it not only as percussion, but plays in perfect dissonance and pedal stomps. Apple uses pauses simply to propel her music forward. Her love songs are heartbroken and will remain timeless. Full of jealousy and are righteousness. “Valentine” [below] is an example of everything I’m talking about. Apple uses her vocals on this record, not only to show us that she still has it, but also as sonic separators. By way of repetitive lines and words. This record is one of the best this year. Having explained that it’s been done for three years, which blows my mind, I think it pray tells that Fiona Apple will continue to dump her brain out on us, hopefully, forever. Even if we have to wait seven years. The Idler Wheel… is unlike her other records. Even though she sings a choruses of “I don’t cry when I’m sad anymore,” and “How can I ask anyone to love me/When all I do is beg to be left alone”, it’s more upbeat. [See below: “Left Alone.”] Sounding like she’s finally figured out how she wants to live her life alone in Los Angeles and control her own output to the world, she sounds happy. I find myself listening to it, over and over again. And it gets better every time. 2012 has been a great year in music so far. And I can’t believe that it’s almost over. This year has brought us plenty of records. Records that you play all the way through in one sitting. Records of longevity. We have a lot to look forward to next year. But the best part about music is that you can always look back. As much as you want. And I know we’ll be looking back on The Idler Wheel… a lot.